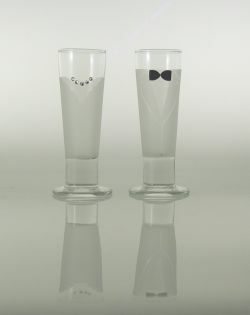 Brand new Bride & Groom shot glasses. Etched glass embellished with crystals on the bride and glass beads on the groom. Available in Groom and Groom as well as Bride and Bride. Handmade by Asta Glass in the USA. Approximately 4 3/4" tall.